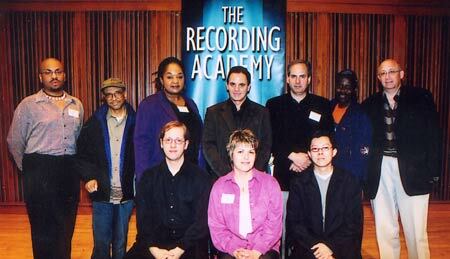 BMI songwriter E. Christine (Chris) Anderson (seated center) was the winner of the 2003 Baltimore Grammy Demo Contest presented by the DC Chapter of the Recording Academy and sponsored by BMI. The demo panel discussion and contest were part of a series of events held this spring during Grammy in the Streets, an outreach program for those currently in the music industry or seeking to enter the industry. This year’s event consisted of mentoring sessions, a panel on distribution, and the 2003 Baltimore Grammy Demo Panel Discussion and Contest. Anderson’s winning song, “Their Leader” is from her Christian pop/rock release WAIT – it’s a musical!, a biblical musical based on the key figures in Luke and Matthew’s birth narratives. It features a variety of musical styles, from Latin to blues to pop and was written specifically for performance by bands and singers. Panelists for the demo discussion spoke about what should be included in a good demo and served as judges for the critique contest. Anderson’s prize package included 10 hours of studio time at co-sponsor Omega Recording Studio, a gift certificate from Guitar Center, consulting time with an entertainment attorney and two artists managers, an on-air interview with Billy Zero on XM Radio’s Unsigned Station (including airplay), and various Grammy merchandise. Hailing from the Washington, DC metro area, Anderson started writing WAIT – it’s a musical! while a student at Wesley Theological Seminary. 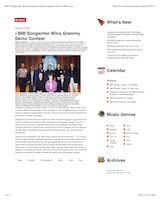 A member of the Recording Academy and the Dramatists Guild of America, she has been playing electric guitar and harmonica in a church band for the past five years. She is a former worship leader, and has also been a player/singer in secular bands, including Metro West, Newtown Hope and Fable Fountain. In addition to songwriting and sitting in with DC area church and secular bands, she is currently acting as a consultant for smaller churches that want to start contemporary services.